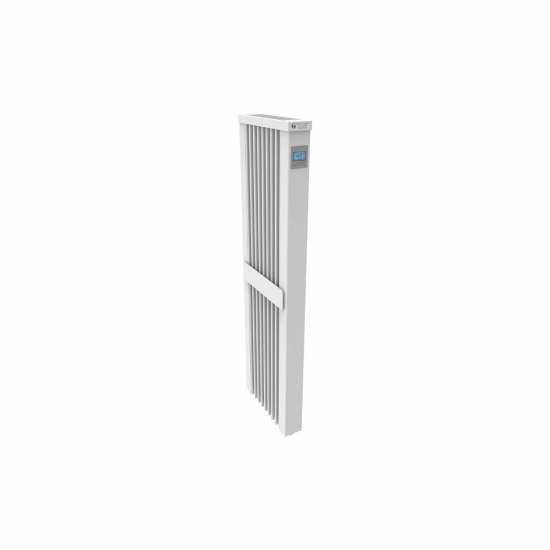 This vertical Aero-Flow electric radiator offers efficient heating even for areas with restricted wall space - perfect for spaces like hallways or kitchens that may have room taken up by fittings and furniture. This electric radiator comes with efficient fireclay heating elements which are great at retaining heat to help slim down your heating bills. Electrorad radiators are easy to install with very basic DIY knowledge . For DIY installation, a plug will need to be purchased and attached to the cable, the radiators then screw to the wall and plug into a normal 13amp socket. Each radiator is supplied with wall plugs, screws, and a template to show you where to put the screws. All you need to do is attach a plug, drill four holes, mount the radiator on the bracket supplied, and plug into the nearest socket. It really is that simple. If you do not wish to purchase a plug, or prefer a wireless finish, Electrorad radiators can be hardwired by a professional electrician. All Electrorad Aero-Flow Electric Radiators come with a 2 Year Manufacturer’s Warranty and a 30 Year Warranty on the radiator body (subject to manufacturer's terms and conditions). This item is available with next working day delivery. Next working day delivery is available when you order before 11am (excluding weekends). Due to its weight, this item is delivered on a pallet. Pallet deliveries are charged at just £39.99 per order. This charge covers every item on your order, no matter how many items you purchase. All pallets are delivered roadside so please be aware you will need someone on hand to sign for the delivery and move the item into your property. To avoid injury, we strongly recommend having 2 or more people for the lifting. Electrorad Aero-Flow Electric Vertical Storage Radiators combine the speed and efficiency of electric heating with the excellent heat retention properties of storage heaters, providing an easy diy install, fully-programmable heating solution for modern homes. Our electric storage radiators optimise energy efficiency with fireclay plate heating elements, a high precision electronic thermostat and fully programmable heating control. These German electric radiators contain fireclay heat plates which heat up within minutes and retain heat for well over half an hour. The heat from the plates warms the surface of the radiator and channels heat outward through the radiator ribs and upwards through hollow steel flutes. This provides the optimum balance of radiated and convected heat, warming you directly as well as warming the air. The combination of fast heat generation and prolonged heat conservation allows you to heat your house on demand – without having to plan in advance as with old-fashioned storage heaters – and helps you take advantage of lower electricity tariffs at different times of the day. The precision thermostat is accurate to within a fifth of a degree, switching the radiator on or off automatically to maintain a comfortable temperature. With good insulation, this means the radiators only use power for a fraction of the time. Fully programmable controls allow you to set a 7 day heating schedule to suit your lifestyle, minimising waste and keeping your heating bills as low as possible. The lockable control panel has a 48-hour battery powered backup, so you don’t need to worry about re-programming you radiators in the event of a power cut. This newer version of the Aero-Flow comes with extra energy-saving features as well as an updated control panel with larger display. Using the new ‘Flexismart’ interface, you can access functions such as open window detection, adaptive start, boost mode and holiday mode. The Aero-Flow can also now be adjusted via distance control when set up with a compatible WiFi gateway (not supplied). The Aero-Flow Vertical range is mess-free, easy to use and very durable. Dry element electric heating carries no risk of leaking, does not produce exhaust gases and requires zero maintenance – with absolutely no servicing costs. Heat can be generated as and when you need it – you don't have to plan ahead and predict the weather as required by old-fashioned storage heaters. Manufactured to high engineering standards, a long lifespan is ensured by quality materials and excellent construction. The traditional steel design of our radiators makes them timeless additions to any home. The radiator's deep set ribs and hollow vertical flutes pay tribute to the innovation for which the manufacturer has recently been awarded a gold medal. The vertical design is ideal for rooms with high ceilings. Electrorad radiators do not come supplied with a plug, which means they will need to be hardwired by a professional electrician. For plug-in-and-go installation, a plug must be purchased and fitted to the cable. The radiators can then be mounted to the wall and plugged into the nearest socket. For more information, check the Aeroflow Manual. Available in five sizes: 650W, 1300W, 2000W, 2500W & vertical 1600W.